Hello my giraffes! Can you believe October is almost over and soon it will be Christmas dinners and parties? It feels like time is in overdrive. 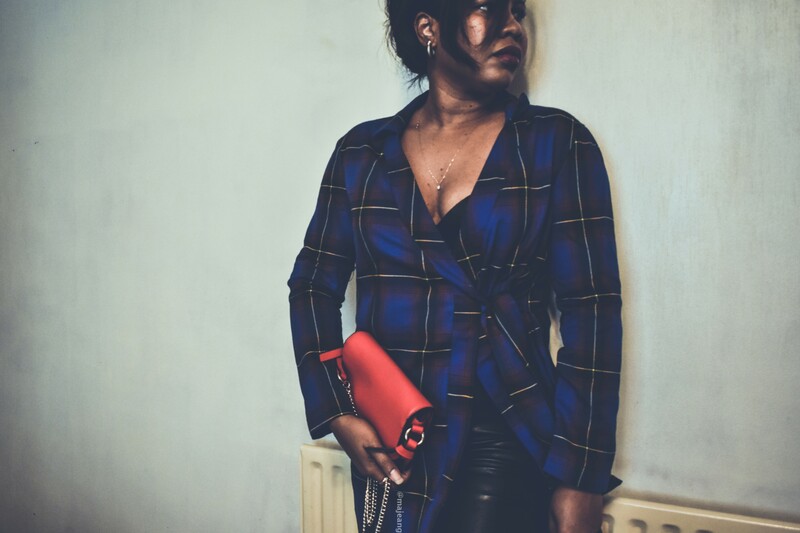 Anyway, today’s post is a fashion related one and it’s how to style a dress two ways. Boohoo contacted me to *collaborate on a post and I thought this would be perfect especially after my last post. Sustainable fashion does not mean wearing the same item, the same way over and over. Challenge yourself and get creative! Tartan and checked print are a huge trend this season however, it seems to always be in season year after year. I think it’s timeless and this dress fits really well into that. I liked the colour ways because it isn’t black but because it’s mostly blue it can pair well with other colours. It’s basically a neutral in my book. Also, wrap dresses are one of the key pieces every 30-something, scratch that, every woman should own. The wrap dress can be worn to so many different events, including Christmas parties. I wore the wrap dress as is with some navy blue boots and a burgundy satchel bag. This look is perfect if you worked in an office or, needed something a little bit more formal to wear. I also added fishnet stockings so you don’t have bare legs and created a seemless look. I’ve seen the dress and trousers look before and knew this dress would be perfect. It’s short enough and with the wrap you can adjust it so there’s a slit. Whilst it’s still warm you can add heels or if you’re going for a comfy vibe, throw on a pair of trainers and you’re good to go! This dress has no stretch so please go up a size especially if you have wide shoulders like me. I liked styling this and would love to play around with this dress a bit more. What do you think about the options? How would you style it? Also, I’m thinking of creating a series where I showcase different ways to style an item, would that interest you? Let me know in the comments. Thanks to Boohoo for collaborating on this post and thank you for reading, commenting and subscribing.